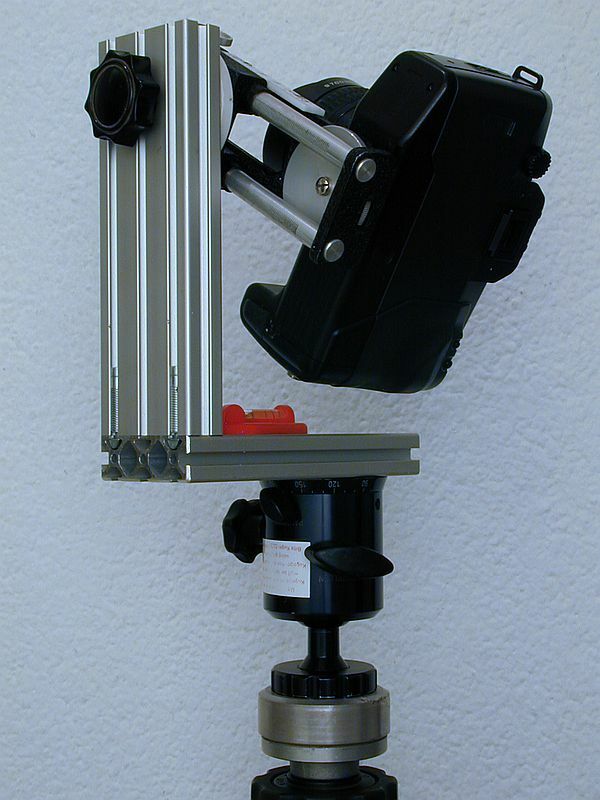 Panoramic tripod heads that allow to pan and tilt around the no-parallax-point use to be quite expensive. 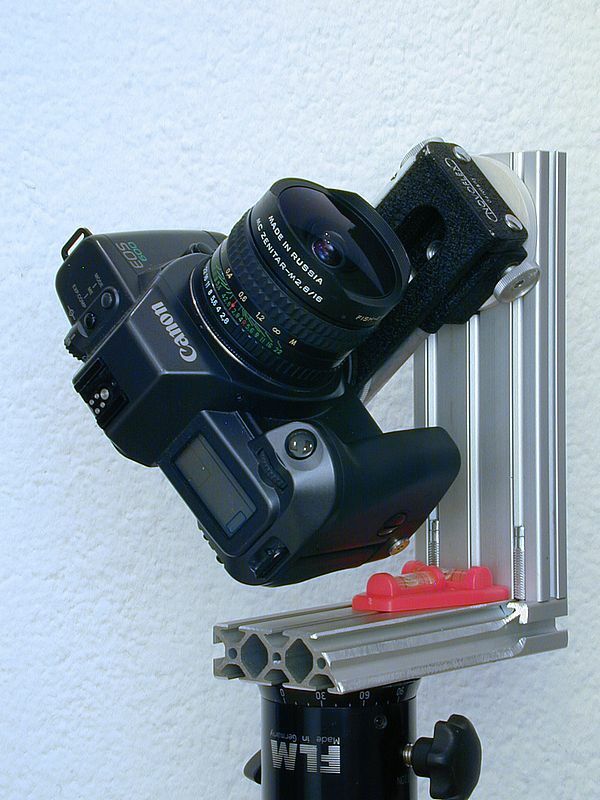 Usually, some kind of (expensive) levelling device is needed in addition to the pano-head in order to allow panning precisely in the horizontal plane. 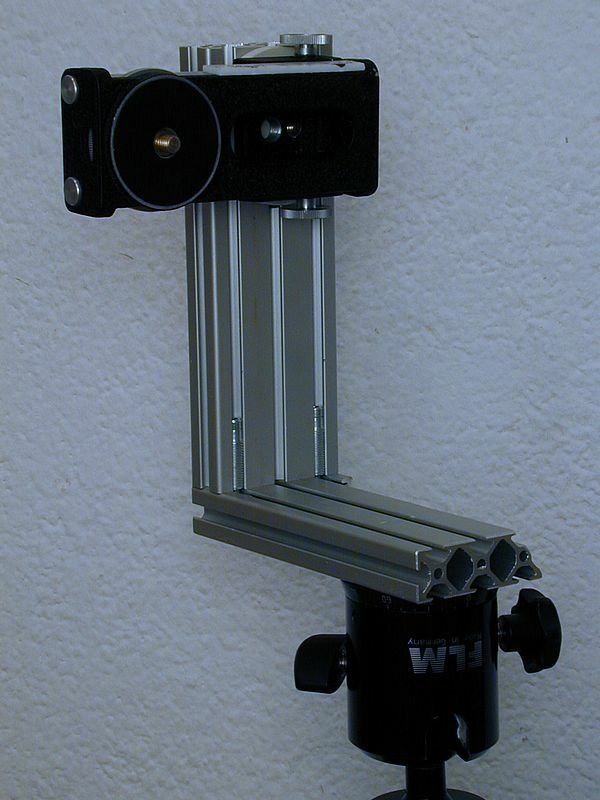 Since I owned a ball-head with a panorama mount anyway, I thought about how it could be upgraded to be a real pan/tilt/level-panorama head with the least possible effort. 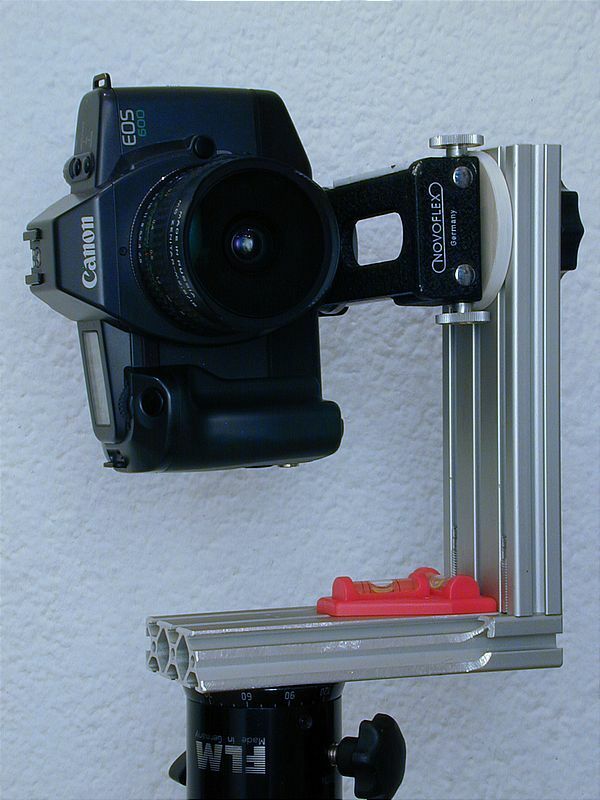 In addition to that, I wanted it to be adjustable to be able to adapt to different cameras, so it needed to have the mounting point adjustable in relation to the pivoting axis. 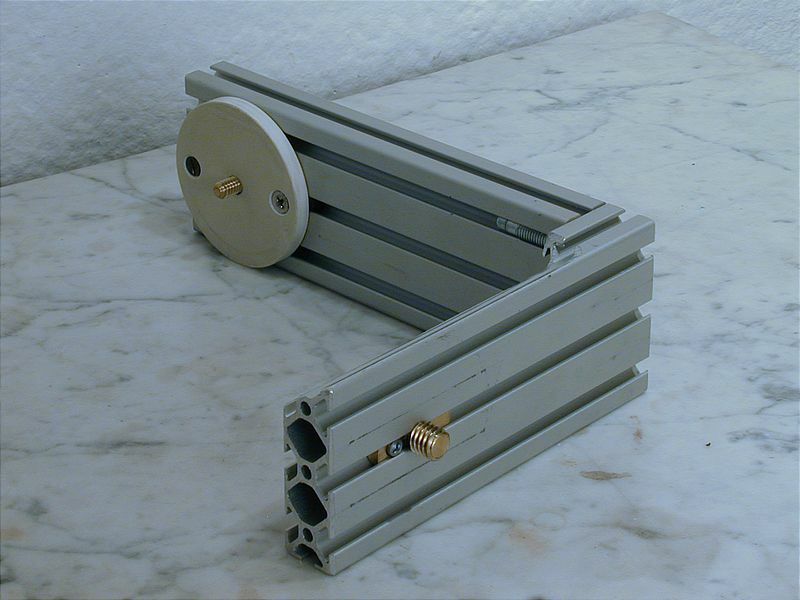 The solution came in form of a special extruded aluminum profile, which a neighbor of my parents used to construct a milling system (source of supply for example: http://www.item24.com or http://www.aluprofil.com/ "Profile 5 60x20"). 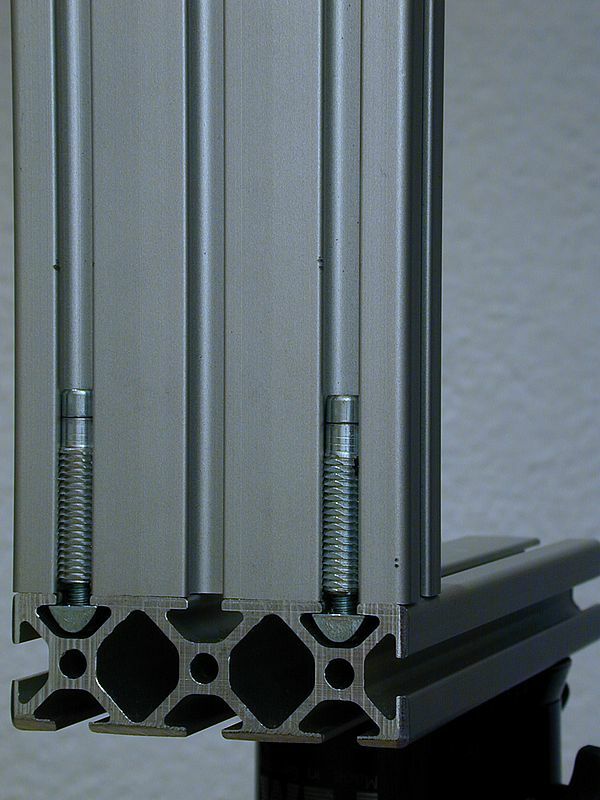 The profile is lightweight and very rugged and it allows for easy corner joints. 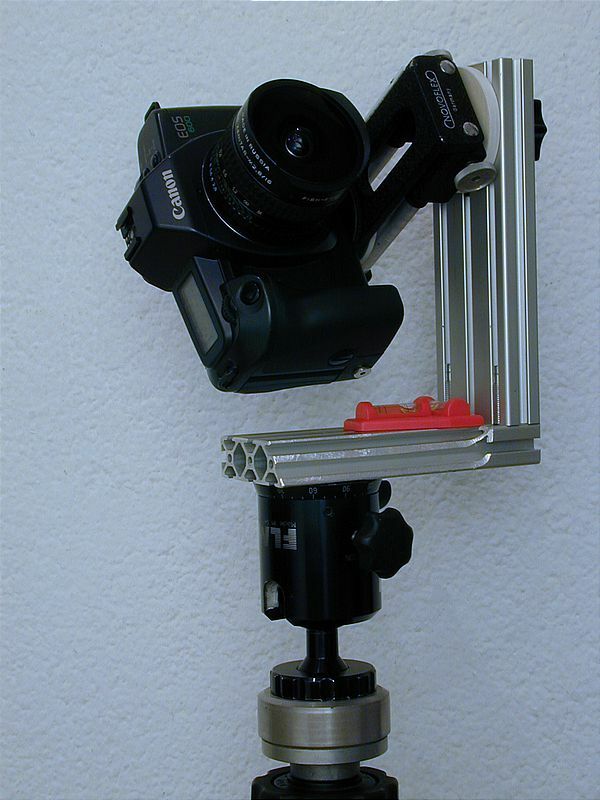 One of the grooves in the profile turned out to be able to accept a slideable tripod mount. To assemble the pan/tilt-head, I needed to machine an adapter for my ball- head to be able to mount the head upside down onto the tripod and the profile onto the panorama-plate of the ball head. This arrangement allows me to easily level the whole setup and still have a smooth and clearance-free horizontal adjustment. the adapter simply contains a continuous 3/8" screw thread and a slight dent on the top with a slanted edge, so that the camera mounting flange of the ball-head fits metal-on-metal. I have machined the brass part with the 3/8" tripod screw thread myself. A countersunk screw allows for fixing it in position in the groove. Anybody who has no access to a lathe could perhaps simply screw an adapter shaft (1/4" - 3/8") onto a groove stone with a countersunk screw. 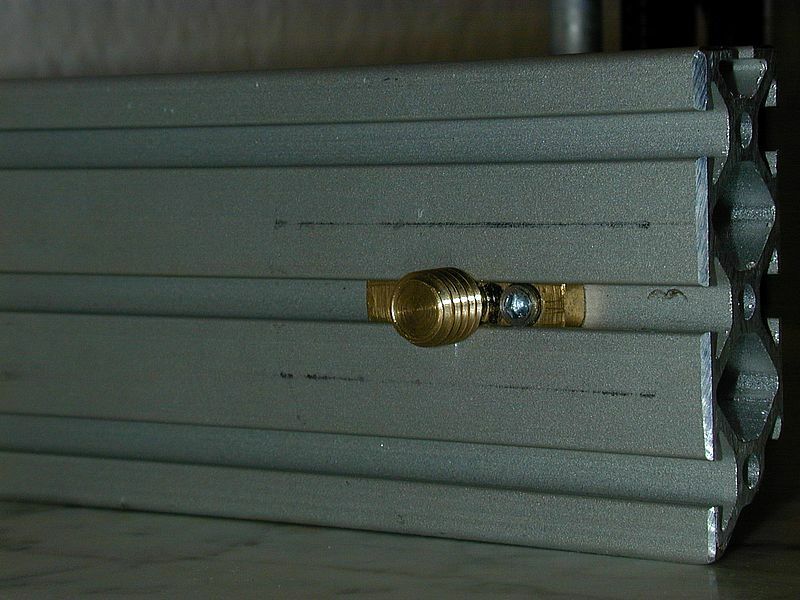 the knob may be replaced by a piece of 1/4" threaded bolt plus a butterfly nut. 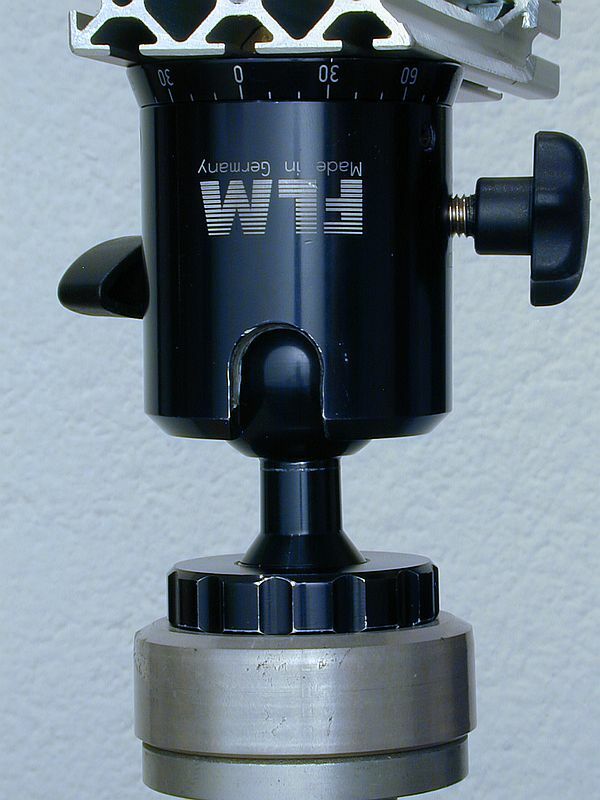 a metric thread may also be cut into the macro slide mount. the white disk serves as a spacer, otherwise the thumb wheels of the macro slide would fall foul with the bracket. 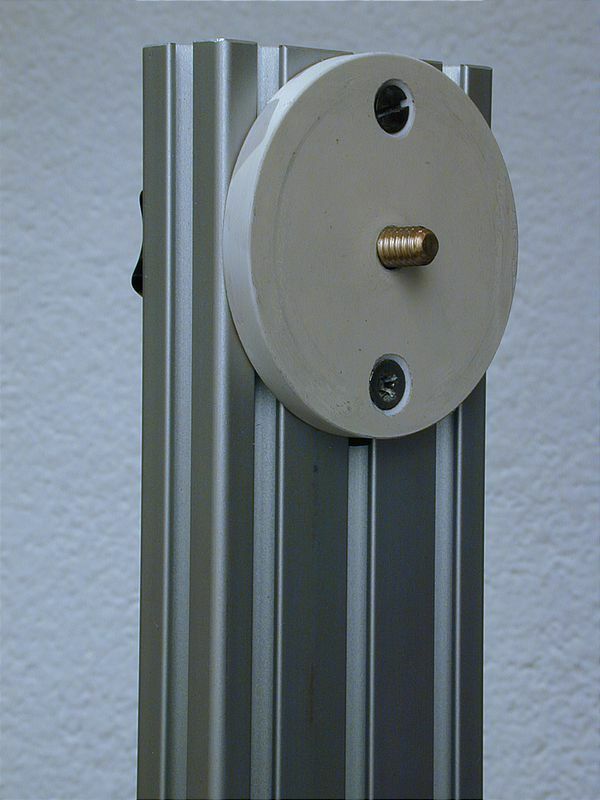 The spacer is mounted on the bracket/groove with two screws in sliding stones. To be able to adjust for different no-parallax-points, I have provisionally retrofitted a simple scale. The axes for the slide (vertical) and the whole setup (horizontal) have to be in a single plane. the no-parallax-point is adjusted using the macro slide. 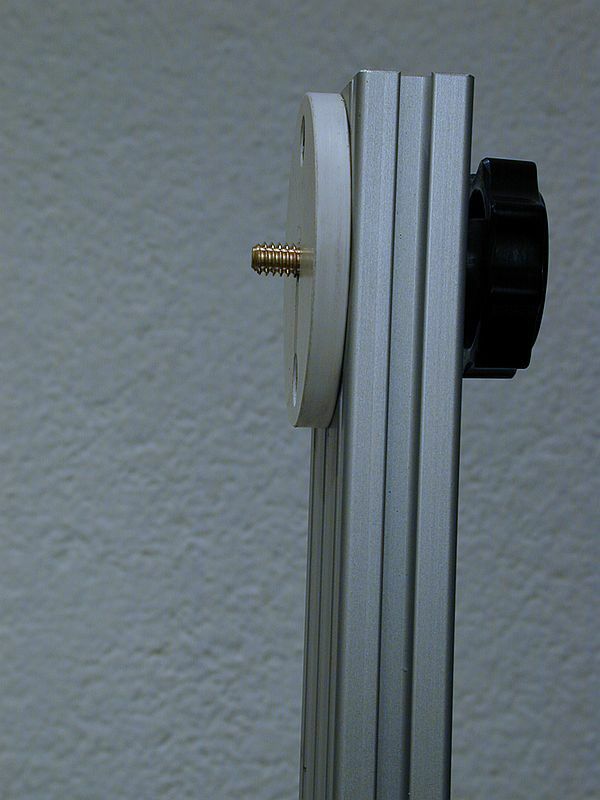 In case the optical axis goes through one of the rotating axes, it automatically goes through the othe as well. 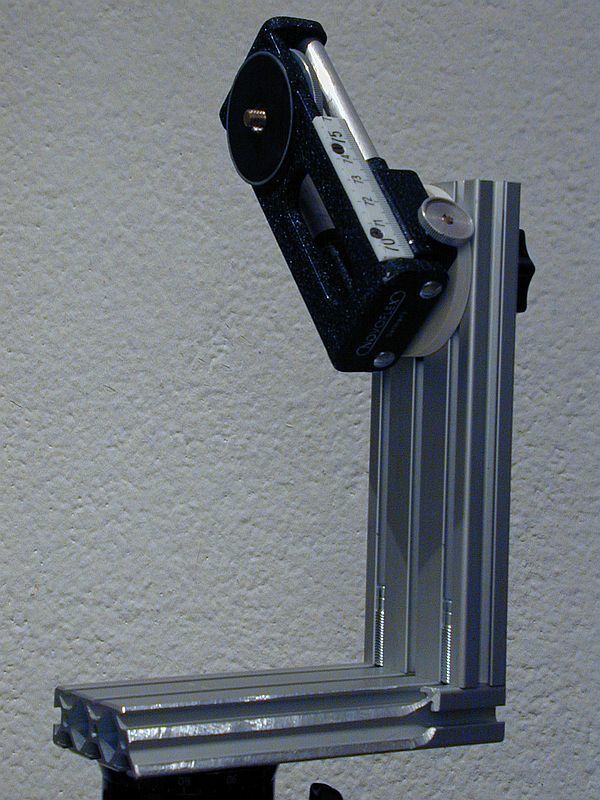 If the no-parallax-point is adjusted correctly with the slide, both tilting and panning is performed around that no-parallax-point.